Form indicates Saints Alive could be the runner to come out on top. The whole thinking be-hind an Assessment Plate is to give the handi-cappers the opportunity to assess whether the merit rating given to any horse is accurate. It affords a trainer the chance to request the handicappers to either drop or raise a rating depending on the outcome of that race. The value of an Assessment Plate could be tested at the Vaal on Thursday when Tammany Hall takes to the track in Race 4 over 1600m on the Classic track which is specifically for fillies and mares. Paul Peter’s charge has raced 11 times for two wins and two places. 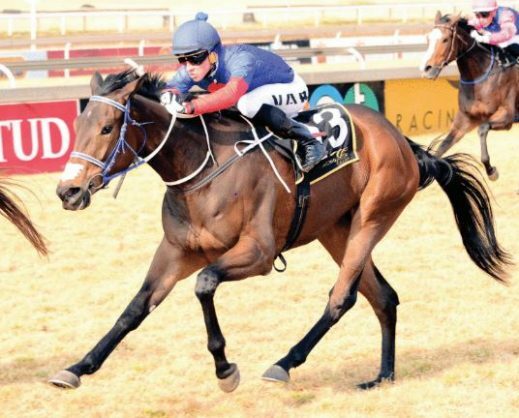 The victories came in her second and third starts, her maiden win coming in a work riders’ event and her second in a FM 68 Handicap in which she beat Fish River Canyon by 0.40 lengths. She was rated at 88 a er that run and that went up to 94 when all the horses in the country received the six-point increase on 1 March. In her eight subsequent races Tammany Hall has run two fourths and her merit rating has started to come down after her last two starts in which she ran unplaced. She now runs off a rating of 83 but is still the best weighted runner in this Assessment Plate by 1.5kg. How she fares in this event will give more insight of how she should be rated although she tries 1600m for the first time and that could work against her. The next two runners on the best handicapped list are more interesting. They have both just turned three-years-old and they are Fariha from the Mike de Kock yard and Saints Alive who is trained by Sean Tarry. Although she has not raced after finishing a 2.05-lengths fifth behind Dagmar in a Juvenile Plate for fillies over 1400m on 7 July, Saints Alive could be the runner to beat. She was not well away on that occasion but ran best of all in a strong field. This daughter of Elusive Fort should prefer this distance, is reasonably well drawn at No 6 and has S’manga Khumalo in the irons. Fariha had her comeback run following a 95-day layoff at the Vaal on Thursday and finished eighth, 5.50 lengths behind Gold Dawn. She was drawn 11 of 13 runners which is not a good place to be in a race over 1450m. This Australian-bred filly won her maiden easily over 1600m in June so this distance holds no fear for her. Randall Simons takes the ride.